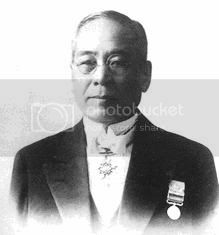 Sakichi Toyoda is a Japanese inventor and industrialist. He was born in Kosai, Shizuoka. Son of a poor carpenter, Toyoda is referred to as "King of Japanese Inventor". Sakichi Toyoda is often referred to as the father of Japanese industrial revolution. He is also the founder of Toyota Industries Co., Ltd. He created a variety of weaving device. The most famous invention is the automatic power loom in which he applied the principles of Jidoka (autonomous automation). Jidoka principle, which means that the machine stops itself when the problem occurs, then became part of the Toyota Production System. Toyoda developed the concept of 5 why: When a problem occurs, ask 'why' five times to try to find the source of the problem, then put into place something to prevent these problems from recurring. This concept is used today as part of implementing lean methodologies to solve problems, improve quality and reduce costs. Toyota Motor Corporation was founded in September 1933 as a division of Automatic Weaving Factory car Toyota. The company's car division and then separated on August 27, 1937 to create the Toyota Motor Corporation as today. Departure from the textile industry, the Toyota plant itself as one of the automotive manufacturer of some standing in the world. Brands that produce 1 car every 6 seconds it was used more for the naming reference to Toyota's better than using the family name of its founder, Toyoda. Here are some exciting milestone Toyota way. Toyota is the third largest automobile manufacturer in the world in unit sales and net sales. Japan's largest manufacturer is producing 5.5 million units worldwide. If calculated, this figure is equivalent to produce 1 unit of the car in 6 seconds. Compared to industries other automotive uses its founder's name as the brand like Honda, founded by Soichiro Honda, Daimler-Benz (Gottlieb Daimler and Karl Benz), Ford (Henry Ford), Toyoda name not be used as a brand. Since the departure from simple ideas and vision that time, the mention Toyoda less pleasant and not so intimately known to diplesetkan Toyota. Sakichi Toyoda was born in February 1867 in Shizuoka, Japan. This man is known as the inventor since I was a teenager. Toyoda devoted his life to studying and developing textile assembly. In the 30 years of age completed Toyoda loom. This then led him to establish the origin of the Toyota assembly, namely the Toyoda Automatic Loom Works, Ltd.. in November 1926. Here patent automatic textile machinery and then sold to Platt Brothers & Co., Ltd.. from England, United Kingdom. Proceeds from sale of this patent, the development of capital used automotive division. Beginning in 1933, when the automobile division of Toyoda building, then a lot of teams run by his son Kiichiro Toyoda, producing endless innovations ahead of his time. Machinery Type A successfully completed in 1934. A year later this engine transplanted the first prototype of their passenger cars, A1. Toyoda automotive division also produces trucks G1 model. In 1936 they launched their first passenger car, Toyoda AA (then still using the name Toyoda). This model was developed from the prototype model A1 and body and machine equipped A. This vehicle is from the beginning expected to be a people's car. Product concept Toyota on hold until now. Four years of waiting for delivery are considered to automotive companies own and break away from their textile industries. Then in 1937 they inaugurated the automotive division and the name of Toyota, rather than Toyoda as a textile industry. Obtaining a Toyota in the Japanese language are represented in the 8 characters, and eight is a lucky number for the Japanese society. Another reason that makes sense is considered automotive industry is a business lifestyle and even the mention of a name (and what sounds like), a side that is so important. Because the name was considered too rigid Toyoda in a dynamic business that turned into a Toyota that felt better. No doubt, the year 1937 was an important era of the birth of Toyota Motor Co., Ltd.. forerunners of the giant Toyota Motor Corp. (TMC) today. Kiichiro Toyoda spirit of innovation is never dim. Toyota later developed into producing powerful vehicles. In the 1940s, Toyota was busy developing the capital including the company entered the bourses in Tokyo, Osaka and Nagoya. After World War II era ended, in the 1950s is proving Toyota sebgai producing tough versatile vehicle. At the time Jeep vehicles familiar in Japan. Inspired by this car, and then develop orototipe Toyota Land Cruiser that came out in 1950. A year later was officially launched early models of the Land Cruiser BJ model. Buln July of that year, a test driver Ichiro Taira trial ended with remarkable results. Samurai character inspired by the Heikuro Magaki Atago Mountain climbing on a horse in 1643, Taira drove his Toyota to BJ Fudo temple in town Okasaki. This well used as a promotional car toughness of all these fields. Not long ago, Toyota Land Cruiser began to rival the dominance of the Jeep Willys. Even with more models, Toyota Land Cruiser can be accepted in the market when it is difficult to penetrate the North America. Through this model, Toyota entered the market in different parts of the world, including in Indonesia known as the Toyota Land Cruiser Hardtop FJ40/45. In Africa, the models are the Toyota Land Cruiser used as an alias Technical armed jeeps equipped submachine guns, heavy guns or bazookas without starting behind (Recoilless bazooka) and deployed throughout the armed conflict with very strong performance. Toyota is not only known through the Toyota Land Cruiser. They also developed a model that became a favorite of the world, a small sedan. Through the Corolla made its debut in 1966, the early generation small sedan was put on the back drive to change the order of the popular sedan bongsor then headed toward the small sedan a compact, efficient and compact. Entering the year 1975, the Corolla into the third generation and sold more than 5 million units. The amazing thing is still strong today. Corolla engine is then used in Indonesia as an engine for multi-purpose commercial vehicle family, the early generation Toyota Kijang known as Kijang Buaya. Along more mengglobalnya Toyota products, they have not realized the logo graphic. Even in Indonesia found the Toyota branded vehicles such as Toyota Kijang with Toyota logo on the grille on the bonnet (nose) car. In 1989 Toyota decided to make two circles oval (ellipse) which produce the letters T and the third ellipse will indicate the spirit of understanding in design. The third circle is the circle once around the ellipse before the T-shaped as evidence of care and affect the surroundings. In the 1990s, Toyota is increasingly proving that Japanese cars can compete with European and American cars. Toyota Celica managed to rally world champion, and the Toyota Camry became best-selling car in America. To write this kind of writing we need bio writing services that will help us is various way. I am so impressed by this. Biography. Powered by Blogger - BlackSplat design by SamK.